Download and Install Mozilla Firefox (3.0 or newer). • Launch Firefox and revisit this page. You can also try in Chrome if you can find how. Install or update your GreaseMonkey Firefox Extension. • Restart Firefox and revisit this page. 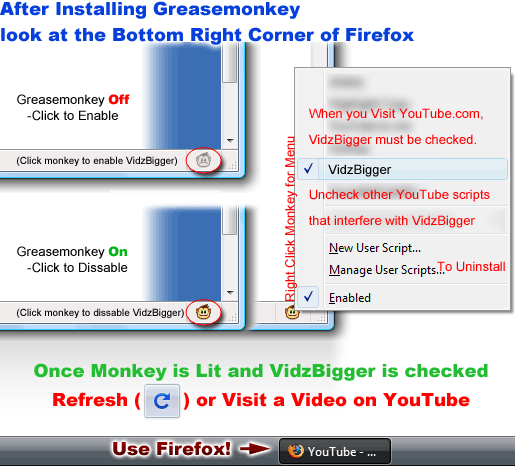 Install VidzBigger - the YouTube Enhancing Greasemonkey Userscript for Firefox. Visit You Tube, or refresh the video you're viewing. Find a Video to Watch and Enjoy! If anything does not work, make sure you're on YouTube or try these videos, make sure GreaseMonkey is enabled (see image at left). If you can't find the monkey you may have to go to Menu View > Status Bar Checked. Then right click the monkey in the Status Bar to checkbox VidzBigger, then refresh the page and watch some video! Use the VidzBig flag (at the top right or left corner of the page) to access Layout Preferences [ ]. Minimum and Maximum Video Size. 2 or 3 column layout. Left, Middle, and Right video alignment. Position and scale the video at the bottom of the page, also center video automatically and resize as there is extra room, make the videos bigger! Automatically Skip Adult Content Confirmation. Easy to use feedback links and built in help/details. Some features such as the precision of video sizing are not up to par at every window dimension. I am still working in my free time on updating this for the new youtube layout. If you have any particular bugs, click the "Send Bugs" button from VidzBigger preferences while the bug is on the screen, and I will be able to reproduce the bug to fix it.